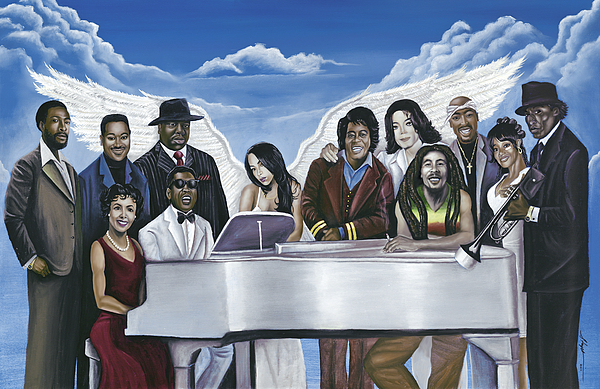 Great tribute to these great artists. HBD Bob. Respect, O. Thanks for comment: From left to right: Marvin Gaye, Luther Vandross,Biggie Smalls.Sitting down: Lena Horne and Ray Charle. 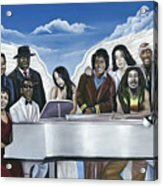 Aaliyah in the middle, Jame Brown, Michael Jackson, Bob Marley, Tupac Shakur, Lisa (left eye) Lopes, Miles Davis. This is my second large oil painting. 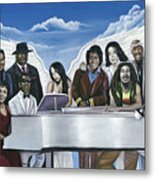 This is a tribute to music entertainers who have passed on. It was difficult to select exactly who I wanted in this piece. So, I decided to include some old, some new, and kind of blend the two together. I couldn't include everyone that I wanted to. I also didn't want to have too many individuals in the piece, like a collage.